STREET SENSE (USA) had the brilliance to win a Breeders’ Cup Juvenile by 10 lengths at two before going on to win the Kentucky Derby at three, and there’s no doubt his talented son Hallowed Crown is a real chip off the old block. The Gooree-bred, whose dam is a Golden Slipper runner-up by champion Danehill (USA) and from the family of champion sire Zabeel (NZ), joins the Darley roster this season after a career on the track that netted six wins in nine starts including a brace of Gr.1s. Those elite wins came in the Golden Rose (1400m) and Randwick Guineas (1600m) and gave the training partnership of Bart Cummings and grandson James their first elite wins as a team. 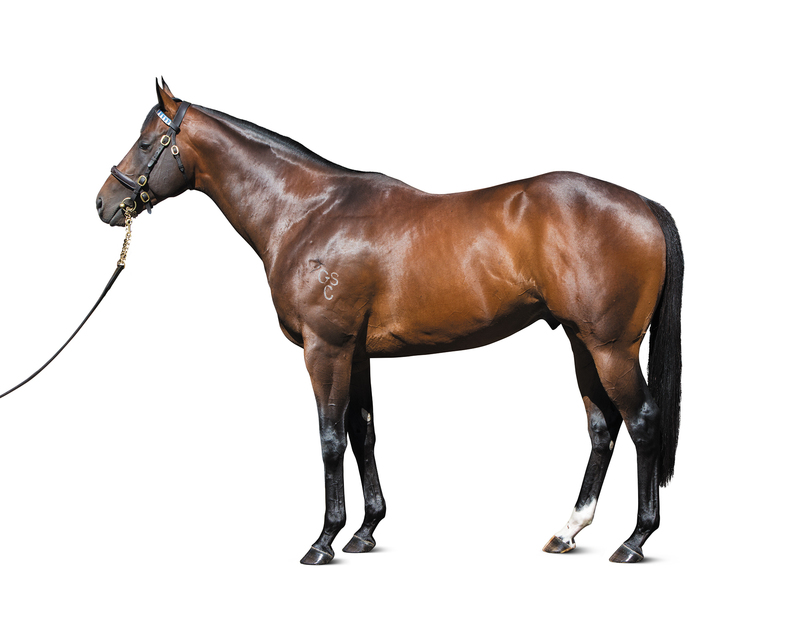 Hallowed Crown gave some inkling of his talent when he won over 1150m at Kensington on debut at two and then franked that form with a win in the Kindergarten Stakes-Gr.3 (1100m) at Randwick next time out, handling the steep rise in company to account for Washington Heights and Klammer. His win in the Kindergarten was something of an historic occasion as it was the first race of the inaugural The Championships in 2014 and came in the first year of the partnership of Bart and James. That win was the first Gr.1 for the training partnership and was even more special as James’s wife Monica Barrera is a grandaughter of Gooree owner Eduardo Cojuangco and is Gooree’s racing manager. Hallowed Crown missed the remainder of the spring after finishing fourth behind Brazen Beau, Nostradamus and Delectation in the Roman Consul Stakes-Gr.2 (1200m) at Randwick. The Hobartville Stakes-Gr.2 (1400m) has long been a launching pad for the best of the three year-olds, it’s a race won by the likes of Lonhro and Pierro after all, and Hallowed Crown showed he was up to such elite company by beating Sweynesse and Kermadec on his return the following February, running 1:23.76 on a good track. He showed the hallmarks of a really good miler with a convincing win over Sweynese (three-quarters of a length) and Shooting to Win (short head further back) in the Randwick Guineas-Gr.1 (1600m in 1:35.06, good (3)). with Hallowed Crown to their outside. The 2000m of the Rosehill Guineas-Gr.1 looked just out of his comfort zone and Hallowed Crown was third (1.4 lengths) behind Volkstock’n’barrel and Preferment, before having no luck from a wide draw in the Doncaster Mile-Gr.1 when 10th to Kermedec, beaten 5.4 lengths. He was then sent for a spell before Gooree and Darley announced the colt would not race again and would stand at Kelvinside, Aberdeen under a partnership agreement on a first season fee of $33,000. Hallowed Crown retired as the winner of six races, a third and a fourth in nine starts for earnings of $1,398,475. He had a World Thoroughbred Ranking of 115 in 2014. His sire Street Sense is the only horse to complete the Breeders’ Cup Juvenile and Kentucky Derby double and won an Eclipse Award for Champion US 2YO Colt. Also winner of the Travers-Gr.1 and runner-up in the Preakness Stakes-Gr.1, he shuttled for five seasons to 2012 and was the Leading Third Season Sire in the US in 2013 (when he was covering at Sheikh Mohammed’s stud in Japan) with Gr.1 winners Sweet Reason (dam by Mt Livermore) and Aubby K (Capote) among nine stakes winners that year. Now the sire of the winners of $32m including additional Gr.1 winners Callback (Forest Wildcat) and Wedding Toast (Coronado’s Quest) among 35SW, his other southern-bred stakes horses include Politeness (Commands; inbred to Natalma), Hard Stride (Maroof), Sense of Occasion (Zabeel) and Champagne Cath (El Moxie; inbred to Raise the Standard). His northern-bred stakes performers include runners out of daughters of Valid Appeal, Horse Chestnut, Singspiel, Coronado’s Quest, Danzig Connection, Deputy Minister, Seeking the Gold, Storm Cat, Bianconi, Personal Flag, Holy Bull, Zilzal, Unbridled, Grindstone, Phone Trick, Time for a Change, Forestry, Gilded Time, El Prado and A.P. Indy. To mid-July he’d sired 319 winners from 488 starters (65.4%) of more than $36m for a winning distance index of 1413m. Street Sense is a son of Darley’s international success story Street Cry (Machiavellian-Helen Street by Troy), a winner of five races including the Dubai World Cup-Gr.1 (2000m) by 4.5 lengths and Churchill Downs Stephen Foster Handicap-Gr.1 (9f) by 6.5 lengths and named Horse of the Year in the UAE. Timeform rated him 130 and he went on to be enormously successful at stud in both hemispheres, but unfortunately was put down in September 2014 after nine seasons of dual hemisphere use. This season has seen top class juvenile Pride of Dubai add to his Australian honour roll, which also includes Whobegotyou (dam by Carnegie), Shocking (Danehill) and Long John (Night Shift). His northern stars are led by US Horse of the Year Zenyatta (19 wins), Street Sense, Street Hero (USA), Street Boss (USA) and Street Hero (USA) as well as international performer, the Gr.2 winner and Gr.1 placed Carlton House (USA) (ex Talented by Bustino), rated 125 by Timeform, who stands alongside Hallowed Crown at Kelvinside ($8800). Street Cry has sired the winners of more than $106m, among them 89 stakes winners. Another son is boom young NZ-based Per Incanto (USA). Street Cry’s stakes placed sister Helsinki (both from Irish Oaks winner Helen Street) is the dam of champion juvenile, French dual classic winner and leading sire Shamardal (Giant’s Causeway). Street Cry has worked very well with Danehill and his sons, for example, Melbourne Cup winner Shocking is from a Danehill mare, and one reason could be that Machiavellian’s dam Coup de Folie is inbred 2x2 to the half-sisters Cosmah (Cosmic Bomb) and Natalma (Native Dancer), both daughters of the Mahmoud mare Almahmoud, while Danehill is inbred 3mx3f to Natalma, dam of his grandsire Northern Dancer (Nearctic) and his second dam Spring Adieu (Buckpasser). Machiavellian’s second dam Raise the Standard is by Ribot grandson Hoist The Flag, while Danehill’s dam His Majesty is by Ribot. His Majesty, a Gr.2 winner and successful sire, features 4fx4f in the pedigree of Hallowed Crown. Machiavellian (Mr. Prospector-Coup de Folie by Halo) was a rare Mr. Prospector son who excelled on the turf in Europe (another being Kingmambo, who is out of champion Miesque by Nureyev) where he was European Champion Two Year-Old with wins in the Prix Morny-Gr.1 and Prix de la Salamandre-Gr.1 before retiring to stud in 1991. The French 2000 Guineas-Gr.1 winner Vettori (IRE) was a member of his first crop and he shuttled to Baramul from 1996-2000. One of Vettori’s daughters produced the dual French classic winner and shuttler Lope de Vega (IRE) to a mating with Shamardal (Giant’s Causeway). Shamardal’s dam Helsinki is a sister to Street Cry, giving Lope de Vega a double of Machiavellian (3fx3m). Daughters of Shamardal to Hallowed Crown would give the brother/sister Street Cry and Helsinki 4x3. in Japan and has had several sire sons stand locally, but the Halo line has come into its own in Australia via Vinery’s Gr.1-winning sprinter More Than Ready (USA) (Southern Halo-Woodman’s Girl by Woodman (USA)), a horse bred on the reverse cross (Halo/Mr. Prospector) to Machiavellian. Daughters of More Than Ready (and his Golden Slipper-winning son Sebring (bred on a Halo/Danehill/Mr. Prospector cross) look likely to suit Hallowed Crown. Street Sense is out of the US $250,000 earner Bedazzle, a daughter of the Pennsylvania Derby-Gr.2 winner and successful sire Dixieland Band (Northern Dancer-Mississippi Mud by Delta Judge). Bedazzle is also dam of stakes winner Elusive Sparkle (Elusive Quality) and is from Listed winner Majestic Legend, a daughter of His Majesty. Next dam Long Legend (Reviewer-Lianga by Dancer’s Image) produced the good US sprinter and successful sire Mr Greeley. Lianga, a Champion Sprinter in Europe whose 11 wins included the Prix Jacques le Marois-Gr.1, Prix Robert Papin-Gr.1, Prix de l’Abbaye-Gr.2 and July Cup-Gr.2, is also third dam of Danehill Dancer (IRE). Daughters of Danehill Dancer and his son Choisir could work well with Hallowed Crown. Hallowed Crown’s dam, Crowned Glory (Danehill-Significant Moment by Bletchingly), won the VRC Bloodhorse Breeders’ Stakes-Gr.3 and was runner-up in the Golden Slipper-Gr.1 behind Belle du Jour. Hallowed Crown, is the best of her six winners, but this daughter of our nine times champion sire also left the talented Needs Further (one of her three winners by Encosta de Lago), who won three of his five starts including the Carbine Club Stakes-Gr.3 and retired to the Whishaw family’s Armidale Stud in Tasmania in 2013 where he stands at just $3300. She also has winners by Elusive Quality (USA) and Fusaichi Pegasus (USA)), both Mr. Prospector line sires, as is Street Sense. Significant Moment (Bletchingly-Lady Giselle (FR) by Nureyev) produced six winners including stakes placed sire Monolith (Danehill) and the handy Hong Kong performer Redoute Star (Redoute’s Choice). Significant Moment is a half-sister to the Australian Guineas-Gr.1 winners Baryshnikov (Kenmare) and Zabeel (Sir Tristram). The latter, a multiple champion sire in Australia and NZ, is now in retirement at Cambridge Stud. This Danehill/Bletchingly mix was seen to advantage in champion sire Redoute’s Choice, who is by Danehill and from a mare by Canny Lad (Bletchingly). Daughters of Stratum and Snitzel, both sons of Redoute’s Choice could be a good fit with Hallowed Crown. Hallowed Crown’s family is that of French Horse of the Year Detroit and her son Carnegie, both Arc de Triomphe winners, of Champion UK Two Year-Old Filly Durtal and her dual Ascot Gold Cup-Gr.1-winning son Gildoran and of classic winners Roderic O’Connor, HK Derby winner Keen Winner and US Gr.1 winner Filago (16c). It is also the family of Gr.2 winner Messene (Lonhro) and Gr.3 winner and Gr.1 placed sire Wellbeing (Sadler’s Wells). The Lonhro connection is an interesting one as he is a grandson of Zabeel and his dam is by Straight Strike (USA), a son of Mr. Prospector. Messene’s dam Belle Giselle is a daughter of Redoute’s Choice and from Baryshnikov’s sister Mam’selle Giselle (Kenmare-Lady Giselle by Nureyev) and he carries Lady Giselle 4mx3f. Duplicating this family could be a wise move as Lady Giselle, an unraced twin, is from Listed winner Valderna (Val de Loir-Derna by Sunny Boy), a half-sister to Cheveley Park Stakes-Gr.1 winner and Champion UK 2YO Filly Durtal (Lyphard) (dam of Dual Ascot Gold Cup winner and sire Gildoran by Rheingold) and Prix de l’Arc de Triomphe winner Detroit (Riverman), herself dam of Arc winner and sire Carnegie (IRE) (Sadler’s Wells), a former shuttle sire for Darley whose daughters are available in Australia.